SGB Pokémon: Blue Version (USA/Europe) in 1:18:58.78 by Primorial#soup. Primorial#soup used CONFUSION. Critical hit! Audience is confused! Pokémon is a phenomenon that made itself very famous in a short time several years ago. 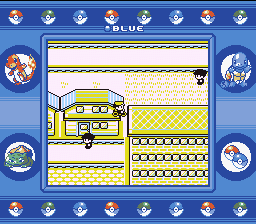 Pokémon: Blue Version is part of the first generation of the games of that series that were made. In this movie, Primorial starts, as usual, as a teenage boy in Kanto with a level 5 starter Pokémon. Through vigorously fighting, intermittently doing actions that apparently make no sense (such as bicycling in circles), he beats all eight seven gym leaders, earning himself their badges and the right to challenge the world champion in Pokémon battles. And he wins, of course ― 23 minutes faster than in the previous movie. It is recommended to read the author's comments as well as the discussion relating to the movie in order to fully enjoy it. There is also a run that glitches to the end of the game faster via overflowing buffers, as well as one that resets during saving, corrupting the save and allowing an even faster completion.